The night was a big success, with all tickets for the dance selling quickly, with £6,128 raised on the night from dance ticket and raffle ticket sales as well as a successful auction on the night. The Rob Roy Preservation Trust are very grateful to all of the following companies and individuals who donated prizes for the auction, as well as all of the people who donated raffle prizes on the night. The crowdfunding appeal on the Just Giving website has now closed having raised £2,192 towards putting the new Rob Roy statue back on the rock. 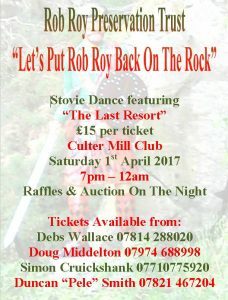 The Rob Roy Preservation Trust are very grateful to all of the following companies for their donations as well as all the individual contributions from locals to Culter and from those further afield, all united in wanting to put Rob Roy back on the rock.